The People’s Court of Ho Chi Minh City on November 25 commenced a preliminary hearing for two defendants involved in a major embezzlement scandal at the Agribank Financial Leasing Company No 2 (ALC II). The accused in a major embezzlement scandal at the Agribank Financial Leasing Company No 2. This is one of the eight key cases that the Central Steering Committee on Anti-corruption has been requested to bring to trial before the 12th National Party Congress, slated for early 2016. 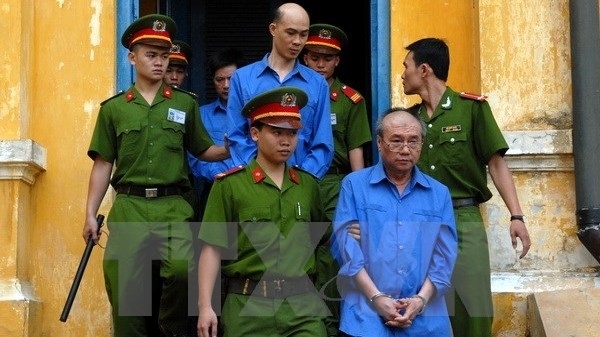 According to the indictment, Vu Quoc Hao, former Director of ALC II and Dang Van Hai, ex-Chairman of Quang Vinh Construction and Trade Co Ltd, were prosecuted for “misappropriating public property” and “intentionally violating State regulations on economic management that causes severe consequences”. Hao owed VND60 billion (US$2.64 million) to Le Hoang Tam, Director of the Hai Phong-based Dai Duong shipbuilding company. Hao transferred the money to Chairman of the Ham Rong Company Le Van Phong to invest in the Truong An apartment project in Thuan An commune of southern Binh Duong province and buy land in District 7, Ho Chi Minh City. To pay the debt, Hao and Hai signed financial leasing and false contracts to withdraw money from ALC II. In addition to taking VND75 billion (US$3.3 million) from his company, Hao misappropriated VND4.9 billion (US$215,600) from a contract signed with Anh Phuong company in the southern province of Dong Nai. The indictment stated that Hao and Hai violated Articles 165 and 278 of the Penal Code. According to law, the highest penalty for such violations is the death sentence. The hearing will run until November 30.